Julie Holbrook is a registered dietitian who has been publishing since 2004. Her articles have appeared in multiple journals such as "The Journal of the American Dietetic Association." Holbrook holds a Bachelor of Science in nutrition and dietetics from Bradley University, as well as a Master of Science in nutrition and dietetics from Northern Illinois University. Due to varying cultures, religions, economies and agriculture of the more than 16 countries which border the Mediterranean Sea, the Mediterranean diet varies. 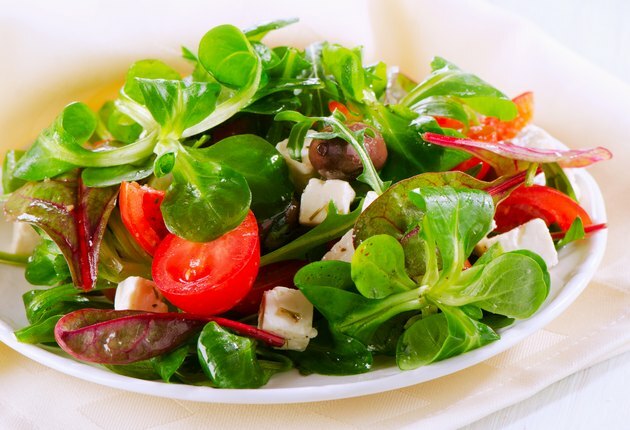 The general diet principles include high consumption of fruits, vegetables, whole grains, beans, olives, olive oil, nuts and seeds, moderate intake of wine and lean meats and low intake of processed foods. Lifestyle factors such as increased physical activity and enjoying meals with a social support system are also part of the Mediterranean way of life. The American Heart Association’s, or AHA, Therapeutic Lifestyle Changes Diet is targeted for people who have elevated lipids and suggests 25 to 35 percent of total calories from total fat, less than 7 percent of total calories from saturated fat and up to 20 percent of total fat from monounsaturated fat. In comparison, the Mediterranean dietary recommendations include total fat content of 25 to 40 percent of total calories, 7 to 8 percent of total fat from saturated fat and more than 20 percent of total fat from monounsaturated fat.